Gary McCoo (left) and Portadown groundsman Walter McElroy working on the Shamrock Park pitch. One enterprising Portadown fan adopted a novel approach to help clear the snow at Shamrock Park on Saturday. 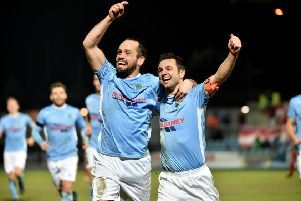 Gary McCoo stepped in to save the day by using an industrial leaf blower to ensure a green light for the Ports’ Danske Bank Premiership date with Ballymena United. Many fans spent Saturday morning using social media - alongside more traditional methods of telephone and word-of-mouth - to discover the risk factor of a postponement. Success arrived thanks to the efforts of supporters and club stewards, with McCoo’s leaf blower providing a welcome spark to the collective efforts. “I live in Richhill and heard talk about the risk to the game when I popped down to the local shop for my morning papers,” said McCoo, a member of the Richhill Reds Supporters’ Club. “I headed over to Shamrock Park to check on the situation and, when I saw it, decided to get a leaf blower. “I work for The David Jameson Group and we often use the industrial leaf blower on jobs so I knew it would solve the problem. “Bryan Hynds provided about 12 bags of salt for the car park and walkways so that was a major help, then we set about clearing the pitch. “Neil McCullough was down and we spent about three hours from 9 o’clock to noon sorting out the snow. “The pitch was fine below the snow so I first went along the lines and cleared the snow, with Neil following and brushing everything away. “Portadown’s groundsman, Walter McElroy, was working away then marked the pitch once ready, with some of the stewards helping out once they arrived. “I put a message up on Facebook asking for fans able to call down to bring shovels and help clear the snow. “A few turned up and we managed to get the job done. “There was a bit of banter with the players from both clubs and I am just happy to help. “I was freezing cold and wet after clearing the snow but got home in time to change then get back for kick-off.